This March, the glitz and glamour of Beverly Hills will launch in New Zealand bricks and mortar stores for the first time, with MECCA set to unveil a line-up of highly coveted Anastasia Beverly Hills brow, lip, eye and face products. The Insta-loved classics that will be making their way into stores include the arch-perfecting Brow Wiz, the all-in-one Contour Powder Kit and fan favourite Liquid Lipsticks, which are all so hyped that it’s easy to forget that there is a single woman (with a lot of help from her daughter) behind the brand. The Anastasia of the title is Romanian-born Anastasia Soare, who gained fame early on as a brow wiz in Beverly Hills salons. The beauty pioneer, creative visionary and powerhouse entrepreneur launched her namesake brand and flagship Beverly Hills salon in 1997, and since then has achieved true beauty icon status, as brow artist to the stars (her first big name was Cindy Crawford) and famed for igniting what we now know as the “brow revolution”. In 2000, Soare launched her very first product line into Nordstrom, and on the back of much success, in 2014 she expanded beyond the brow category with the introduction of a prestige cosmetics line. Anastasia Beverly Hills has attributed a cult following which extends across the globe, so to finally have this line up in store and able to be played with is just huge. The collection landing at Mecca stores will be vast, but a couple I’m excited to see – that aren’t about brows – are the Modern Renaissance Palette (RRP$86) and the Sugar Glow Kit (RRP$84). 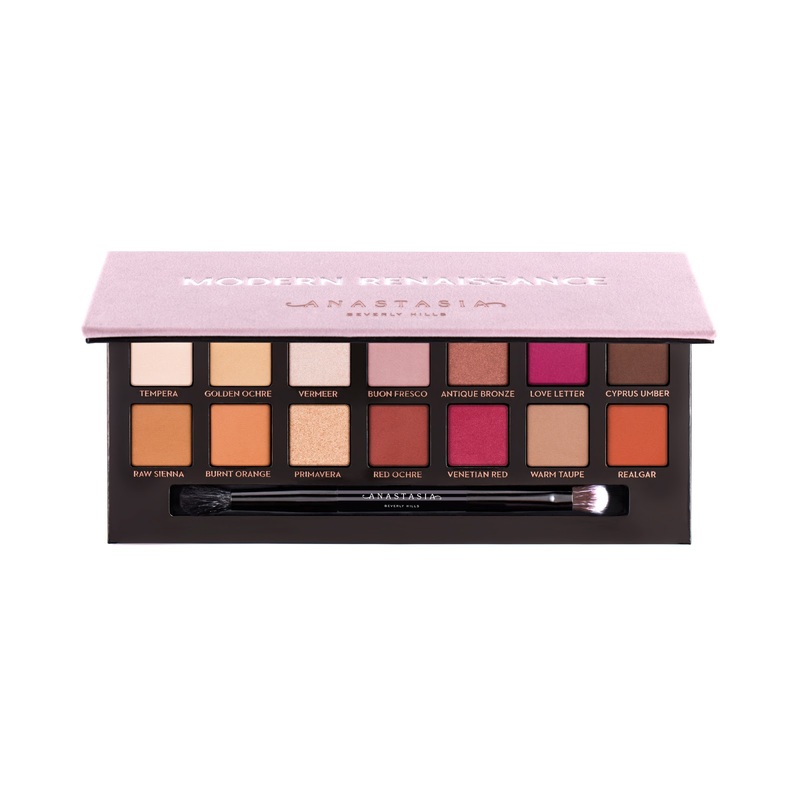 Inspired by the resins and paints of Renaissance art, Anastasia Beverly Hills Modern Renaissance Eye Shadow Palette (above, top) contains an amazing fourteen full-pigment shades ranging from neutral to berry tones in matte and metallic finishes. The essential eye shadow collection features ABH’s highly-pigmented, easy-to-blend formula and offers a versatile colour range for creating everything from subtle to dramatic eye looks. It’s a one stop shop for eyes, if you will, and perfect for pros and novices alike. The all-in-one Sugar Glow Kit (above, bottom centre) contains four shades of highlighting powder featuring pink tones and intense luminosity. With a lightweight, refined formula, each shade delivers buildable coverage with a metallic-lustre finish that is super flattering and never too glowy. It’s a great addition to any kit IMHO, and a great handbag essential. 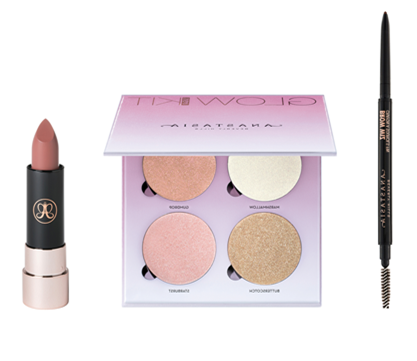 Anastasia Beverly Hills will launch exclusively into all New Zealand Mecca Maxima and MECCA stores, as well as selected Mecca Cosmetica stores on 29th March, 2019, as well as online at meccabeauty.co.nz. Get saving now!